This gluten-free fried chicken, with its batter of cornstarch and coconut milk, makes the best fried chicken. No one will even notice it’s gluten-free and dairy-free. 1. In a large bowl, whisk together the coconut milk, eggs, chili powder, salt, and pepper. Add the chicken, cover, and refrigerate for at least 1 hour and, preferably, 8 to 12 hours. 3. While the oil heats, in a shallow bowl, whisk together the flour, cornstarch, Old Bay, and baking powder. Drain the chicken, discarding the excess marinade. Working with one piece of chicken at a time, dredge it in the flour mixture, turning to coat all sides, and then place the chicken on the baking sheet. 4. Carefully add the chicken to the hot oil, working in small batches so as not to crowd the skillet, and fry, turning occasionally, until the chicken is cooked through. The thigh meat should register 170°F (77°C) on an instant-read thermometer, which will take 20 to 25 minutes for large pieces such as the breasts and about 7 minutes for the small pieces such as wings. The exact timing will depend on the size of your chicken pieces. Using tongs, transfer the chicken to a brown paper sack to drain on a brown paper sack. 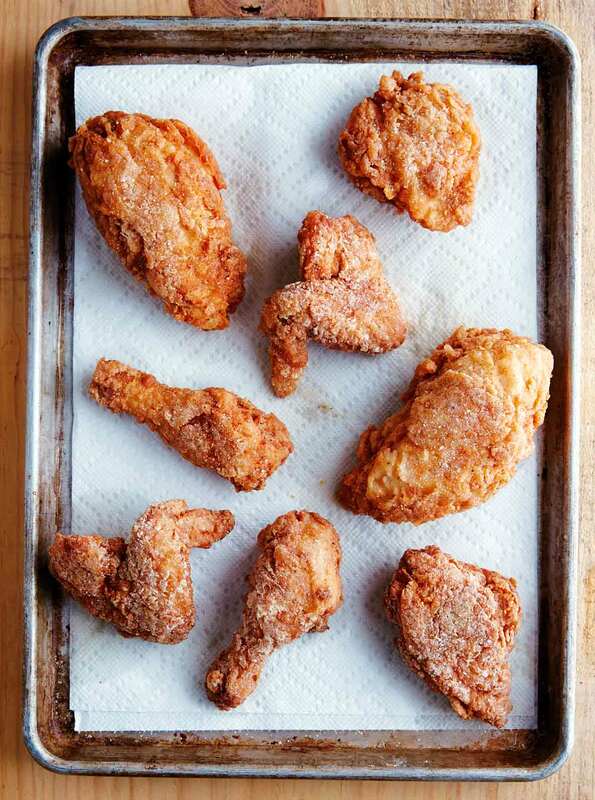 (The fried chicken can be kept warm in a 250°F (121°C) oven for up to 1 hour or served at room temperature.) Don’t forget the napkins. 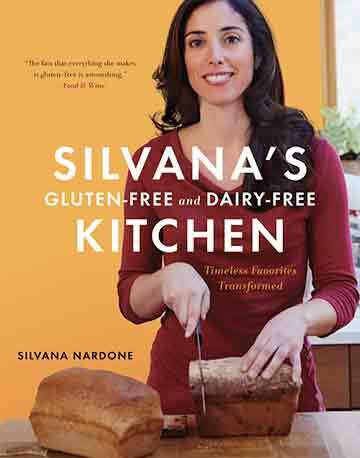 Gluten-Free Fried Chicken Recipe © 2014 Silvana Nardone. Photo © 2014 John Kernick. All rights reserved. All recipes and photos used with permission of the publisher. This is the most amazing fried chicken recipe! It made a crisp and light coating that wasn't greasy, and the meat was deliciously moist with just a hint of coconut flavor in the finished chicken. The seasoning in the coating was subtle but nicely so. I used 3 1/2 pounds (1 3/4 kilograms) bone-in, skin-on chicken breasts cut in half to make 8 pieces. I chose to marinate the chicken overnight. Frying the chicken took me 30 minutes, as I wanted to ensure the chicken was cooked through. My instant-read thermometer wasn't reading correctly, so I chose to give the chicken a little more cooking time rather than chance a piece being underdone. The chicken was proclaimed better than the stuff from "that take-out place” by all my tasters. The fact that it was gluten-free was certainly a bonus. That meant as someone who is wheat-sensitive, I could enjoy it, too, without taking off the yummy crispy bits. As a matter of fact, when I came downstairs this morning, my husband was rooting through the fridge looking for the leftover pieces. (I hid them for my daughter's and my lunch tomorrow.) He even tried to bribe me into telling with fresh coffee! There was a lot of dredging flour left over after making the chicken, almost a full cup, and that seemed a little wasteful. Next time I will probably only use 1 cup flour and maybe increase the Old Bay seasoning to 3 tablespoons to see if that makes any difference. I certainly won't be using regular flour to make fried chicken anymore, as this was so much better. "Moisture galore" are the first words that we all thought of when we tried this gluten-free fried chicken. Even the chicken breast was juicy as can be, and the outside crust was, indeed, nice and crisp. Not one family member did not like this fried chicken. I let the chicken marinate for about 6 hours in the coconut milk mixture. It covered the chicken perfectly, so I did not have to move the pieces around throughout the day. Once I started frying, I decided to first fry the larger pieces, meaning the breasts, and leave the wings for last. I was timing the whole process in increments of 5 minutes. The breasts took about 20 minutes while the wings were more like 7 minutes. Even with so little oil, the flour didn't stick to the pot at all, and it also didn't fall from the chicken, which in turn created nice, crisp chicken. I let the chicken rest on brown paper bags after being fried, as they soak up some of the oil yet leave the chicken crisp. I must admit that coconut milk would not have been my first choice to make fried chicken. Neither would making it gluten-free. But since my spouse is gluten-intolerant, I figured I would give this gluten-free fried chicken recipe a try. Let me tell you, I'm glad I did. The flavors are out of this world, and the crispness of the coating is spectacular. I also found it to be nowhere near as greasy as traditional fried chicken. The chicken was moist and tender, and all the juices stayed where they belong. The coating stayed intact without any greasy oil absorption. This recipe is well-written, a breeze to follow, and the quantities and times are on the money. All the ingredients should be available in your local supermarket. I made no changes to this recipe at all. I marinated the chicken in the fridge overnight and them some—about 12 hours. I dredged all the chicken while the oil was heating and used the parchment paper to hold it. Using a cast-iron skillet, I was only able to fry 2 pieces at a time. The flour didn't become soggy at all by the time the last pieces were fried, so no issue there. I kept the chicken warm in a 200°F oven. I recommend doing the dark meat and white in different batches because the times are a bit different. Also, using a meat thermometer is helpful because the coating browns quickly, and though the chicken may look done, it's not. ( I use only organic chicken in my cooking, as I find it has a nicer texture and flavor, but the downside is that you have to cut it up yourself. However it is worth learning how to do it. They are far superior to the so-called super chickens. Enough said.) As I didn't have a brown bag, I used a layer of paper towels to drain the chicken. However, I was pleasantly surprised to see that there was no excess grease, so only a wire rack was really needed. I for sure will be making this recipe again. One last thing, the crispness of the coating holds up well and remains crisp even after an overnight stay in the fridge. Just another plus for this recipe. This is one fine recipe for fried chicken. Hello, for the gluten and dairy free fried chicken, what happens if you omit the eggs? Does the breading fall off during frying? I’d like to prepare this for a friend who is gluten/dairy free, but she is also allergic to eggs. Thoughts? Megan, yes, the egg is included to act as a binder. However, coconut milk is quite thick and just may serve the same purpose given that it is loaded with fat (albeit the good-for-you kind of fat). We didn’t test it without the egg so I can’t guarantee it, but I would try it without the egg. The result, I think, will be a subtly crisper, thinner coating that may flake off in a few places. Be certain to pat the chicken pieces completely dry before putting them in the batter mixture as that will help the batter adhere. And kindly let us know how it goes! Also, bless you for making this for your friend. I’m certain she’ll be so touched by your thoughtfulness. Amazing recipe!! We’ve been gluten free for years, and I’ve only attempted fried chicken a couple times before this. Nothing has ever come close to being as legit as this recipe!! Thanks! Magnificent, Anita! Thank YOU for taking the time to let us know how much you love this! Do you think I could substitute another starch for the corn starch? I’m allergic to corn as well as being gluten sensitive but really want to try this recipe. Thanks for posting it. Beth we didn’t test it any other way, but you can try potato starch. If you do, please let us know your results so that we might help others. Beth, did you try an alternative? I’m in the same boat and curious about your results.